Can’t swim? No problem: there are a range of Cairns tours and activities tailored to ensure non-swimmers can still visit, explore and enjoy the Great Barrier Reef. Outer reef pontoons and Great Barrier Reef islands are definitely the best option for non-swimmers, providing the comfort and stability of being off the water on a stable platform or land. Cairns Great Barrier Reef activities for non-swimmers include glass bottom boat tours, semi-submersible tours, a visit to an underwater observatory and marine biologist lecture. These activities are all included in the outer reef pontoon tours with Reef Magic Cruises, Sunlover Cruises and Great Adventures. When you are not in the water, relax on the sun decks comfortable lounges, or chill out on the canopy covered main decks. New technology also allows non-swimmers to go underneath the water in a fully-supervised helmet dive. It’s an updated version of the pearl-diving helmets of old and you can do it on its own, or with a motorised underwater scooter, to explore the Great Barrier Reef in comfort and safety. This is an additional cost to most day tours, but definitely worth the investment for non-swimmers. Green and Fitzroy Island are another option for non-swimmers, who can explore these tropical Great Barrier Reef islands and relax on beaches facing the Coral Sea. Take advantage of resort facilities, including bars and restaurants. Great day tour for people of all ages. Visit Outer Reef Pontoon at Moore Reef, with lots of inclusions: snorkelling, glass bottom boat and semi-sub tours, underwater observatory and more. The Ultimate Great Barrier Reef Cruise - Quicksilver Cruises provides the only Port Douglas Great Barrier Reef pontoon tour, departing Marina Mirage daily. Can snorkel and dive, Semi-Submarines & Underwater Observatory. There are three (3) departure and return times for the half day tours, which means this trip can be accommodated into most itineraries. Great Adventures offer two departure (8.30am - 10.30am) and return times (2.30pm - 4.30pm) for their full day tours. Flexible option, suitable for families. Half day tours from Cairns to Green Island. Morning (9am) and afternoon (12.45pm) departures. Up to 2 hours to explore Green Island. Rainforest walks, swimming and snorkelling from the beach. Green Island day tours run by a locally owned and operated company. Departs at 9am and returns at 5pm. Plenty of time to explore Green Island's rainforest, sandy beaches and fringing reefs. Great value. Unique Cairns to Green Island sailing day tour. Max number of guests = 35. Snorkelling & diving plus time on Green Island. Buffet lunch + morning and afternoon tea included. Friendly crew. Up to 5 hours at the reef. Outer Great Barrier Reef pontoon with fabulous coral gardens. Meet Wally! Lots of inclusions: snorkelling, glass bottom boat, semi-sub, underwater observatory and more. Leaves later than most (10am) and provides up to 3 hours at their outer reef pontoon. Enjoy the sun deck, underwater observatory, semi-submersible and many optional extras. This is the only Cairns day tour to combine time on Green Island with a visit to a Great Barrier Reef pontoon. Best of both worlds. Suitable for snorkellers and divers. Great day tour for people of all ages. 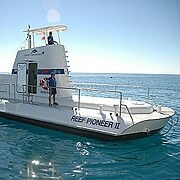 Visit Arlington Reef Pontoon see the Outer Great Barrier Reef in half a day. Includes Snorkeling, Underwater Observitory and BBQ Lunch. Where is the best place to visit the Great Barrier Reef?